CONSTRUCTION OF THE GLEN CANYON DAM (SERIES 25473). PHOTO COURTESY OF THE UTAH STATE ARCHIVES AND RECORDS SERVICE. This is the second in a series of re-purposed blog posts written in my role as an archivist at the Utah State Archives and Records Service. These posts will illuminate the story of Utah’s role in the larger western movement to try and tame the Colorado River and use its waters for unprecedented development in the arid west. With the passage of the Colorado River Compact of 1922, the Colorado River Basin was divided into a Lower Basin unit (comprised of Arizona, California, and Nevada), and an Upper Basin unit (composed of Colorado, New Mexico, Utah, and Wyoming). For the first twenty-five years after the compact was ratified, the bulk of development that took place on the river occurred in the Lower Basin. The construction of Hoover Dam, and other projects in the Lower Basin, had a direct impact on growing the human populations of the southwest. This, in turn, fueled the need for ever-more water in the region. With the lower basin’s voracious hunger for water, a movement to begin developing the Upper Basin’s water allotment gained real momentum. This movement was fueled, in part, by concerns among leaders in the Upper Basin that unclaimed water in the north would be forever captured and taken by the unquenchable thirst of agriculture and populations sprouting up in California, Arizona, and southern Nevada. 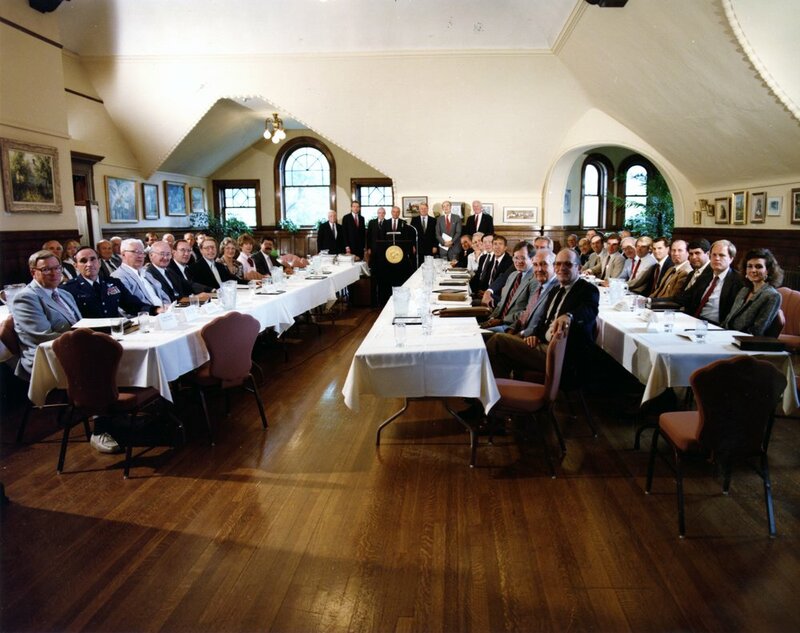 Negotiations for how to divide the Upper Basin share of the river began when representatives from each Upper Basin state met to discuss the issue in 1946. Utah’s interests in this ongoing negotiation were represented by both Governor Henry Hooper Blood, as well as Utah State Engineer, Ed H. Watson. 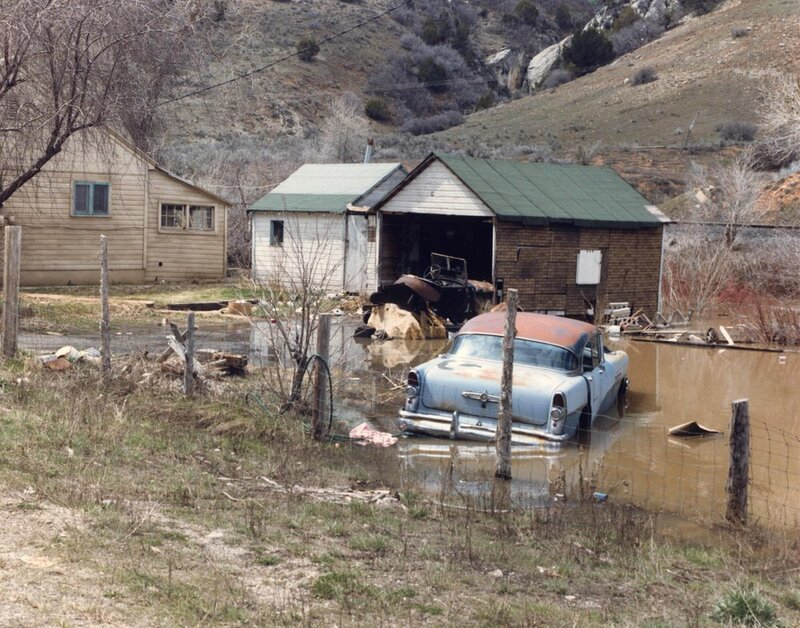 Records from Watson’s office, in particular, reveal how prominently involved the State Engineer was in ensuring Utah received an equitable portion of the Upper Basin river allotment. Two years of negotiation and planning ultimately culminated in the Upper Colorado River Basin Compact of 1948. This new accord added another chapter to the expanding Law of the River by guaranteeing a fixed percentage of water from the Colorado River to each Upper Basin state on an ongoing annual basis. Under the terms of this agreement, Colorado would receive 52% of the Upper Basin share, Utah 23%, Wyoming 14%, and New Mexico 11%. In addition, Arizona was allotted a 50,000 acre foot share for the small portion of the state that lies north of the division boundary line at Lee’s Ferry. With an agreement between the Upper Basin states on how to share their allotment of the Colorado River, the stage was set for the emergence of a massive, federally backed plan that would usher in an era of unprecedented change in the Intermountain West. PRESIDENT EISENHOWER TRIGGERING CONSTRUCTION OF DAMS AT FLAMING GORGE AND GLEN CANYON (SERIES 200). PHOTO COURTESY OF THE UTAH STATE ARCHIVES AND RECORDS SERVICE. With a compact among the Upper Basin states in place, a plan begin to take shape that would coordinate and guide development in Colorado, New Mexico, Utah, and Wyoming. Over the course of eight years, planning and negotiations took place that finally culminated with passage of the Colorado River Storage Project Act (CRSPA) of 1956. The provisions of this plan were broad and complex. At its heart the CRSPA sought to set in motion the construction of major water storage projects in the Upper Basin, as well as devise the means for transporting water across vast areas for the benefit of municipalities in the Colorado River Basin. CRSPA also marked a moment of important transition for the Bureau of Reclamation, and how it approached dam construction in the arid west. Prior development in the Lower Basin was done for the primary purpose of impounding a water supply that could be used for irrigation. Hoover Dam allowed for the generation of electrical power, but power generated by the dam was sold to growing populations in Los Angeles and Las Vegas, with the cash generated from that sale being used to pay off the original construction costs for the dam. With CRSPA, a new model employed by the Bureau of Reclamation in its dam construction and management. Under this new method, the preeminent use of impounded water in the Upper Basin was no longer for irrigation, but rather for hydroelectric power generation that could be sold cheaply to the public. Revenues generated by these “cash register” dams were then used to subsidize farmers in the Upper Basin who, due to environmental constraints inherent to the Intermountain West, were generally unable to grow the wide variety of agricultural commodities routinely produced by their counterparts in the Lower Basin. This thorny issue of balancing a public utility produced by a government agency against the interests of private public utility companies became one of extreme importance to the administration of Utah Governor George D. Clyde in the early 1960’s. In the ensuing decades after the passage of the CRSPA, its ambitious goals began to take tangible shape on the western landscape. 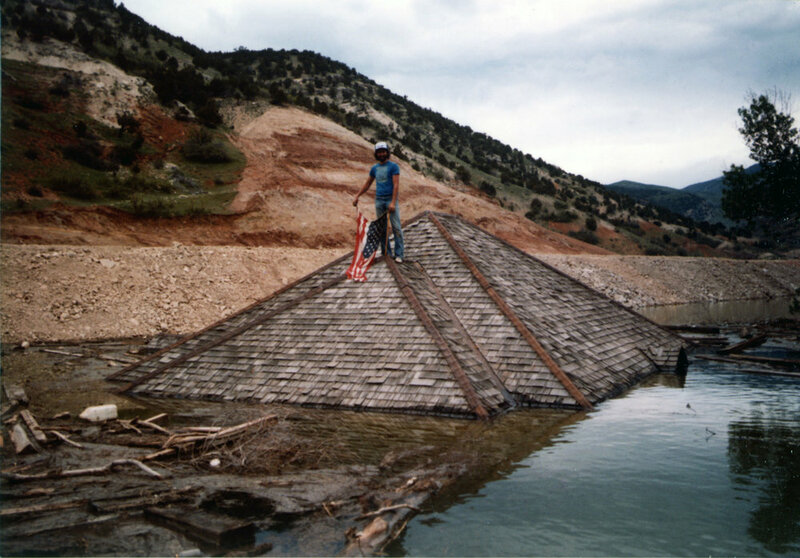 One of its faces became the dams associated with the Curecanti Project in Colorado. Another was the Navajo Dam constructed in northwestern New Mexico. Along the Utah and Wyoming border CRSPA took shape in the form of the Flaming Gorge Dam. And, perhaps most famously, CRSPA led directly to the controversial construction of the Glen Canyon Dam along the Utah and Arizona border. PAMPHLET ADVERTISING THE ECONOMIC BENEFITS OF UPPER BASIN DEVELOPMENT (SERIES 200). PHOTO COURTESY OF THE UTAH STATE ARCHIVES AND RECORDS SERVICE. The story of Glen Canyon Dam remains a contentious moment in U.S. environmental history, as it squarely pitted the interests of the Bureau of Reclamation and western developers against those of a burgeoning American environmental movement. When planning first began on the Upper Basin developments that would culminate with dams at Flaming Gorge and Glen Canyon, planners first cast their eyes east towards Utah’s Uinta Basin. In the mid-1950’s planners and promoters pushed for the construction of two dam sites in Dinosaur National Monument, one at Echo Park (at the confluence of the Yampa and Green rivers), and one at Split Mountain. An unexpected push against placing the dams in Dinosaur National Monument by an organized environmental movement ultimately led planners to abandon the effort, and the U.S. Congress to enact laws that better spelled out the types of development that could occur in National Park Service areas. The complex legal discussions pertaining to Echo Park and Glen Canyon can be traced through records created by Utah’s Attorney General, and held at the Utah State Archives. With the Echo Park development off the table, and a promise from the Sierra Club not to oppose a dam site at Glen Canyon, the Bureau of Reclamation moved forward with development along the border of Utah and Arizona. With passage of CRSPA, and allocation of $760 million in federal funds for Flaming Gorge and Glen Canyon, construction on Glen Canyon Dam began in late 1956. Upon its completion in 1966 its impounded waters (named Lake Powell after General John Wesley Powell who had first navigated the whole of the Colorado River in 1869) could reach a full capacity of 26, 214,900 acre feet, making it the second largest development along the Colorado after Lake Mead. The construction of the Glen Canyon Dam has long served as a significant moment of loss for many who were able to witness Glen Canyon before it was flooded by the dam. CRSPA was a crucial moment in both the river’s history, as well as Utah’s relationship to it. 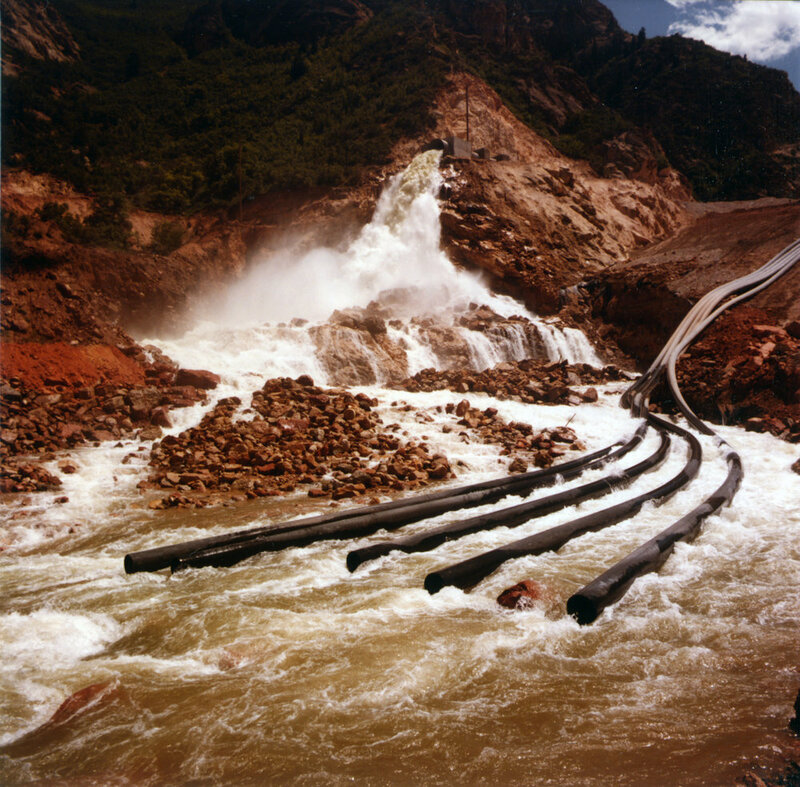 In addition to providing the mandate and funds to build the dam sites at Flaming Gorge and Glen Canyon, this legislation also authorized the creation of the Central Utah Project (CUP), a federal water project specifically tasked with overseeing Utah’s use and development of its allotted share from the river. The story of federal efforts to establish and manage the Central Utah Water Project, which has proven to be among the most complex and costly provisions of CRSPA, will serve as the subject for the final blog post in this series. PAMPHLET PROMOTING RECLAMATION EFFORTS AT ECHO PARK (SERIES 200). PHOTO COURTESY OF THE UTAH STATE ARCHIVES AND RECORDS SERVICE. Reisner, Marc. Cadillac Desert: The American West and Its Disappearing Water. New York: Penguin Books, 1993. Worster, Donald. Rivers of Empire: Water, Aridity, and the Growth of the American West. New York: Oxford University Press, 1992. WATER ALLOTMENT MAP SHOWING THE UPPER AND LOWER BASIN’S (SERIES 200). PHOTO COURTESY OF THE UTAH STATE ARCHIVES AND RECORDS SERVICE. This is the first in a series of re-purposed blog posts written in my role as an archivist at the Utah State Archives and Records Service. These posts will illuminate the story of Utah’s role in the larger western movement to try and tame the Colorado River and use its waters for unprecedented development in the arid west. The Colorado River originates in the high Rocky Mountains of Colorado, before making its 1,750-mile journey to the Pacific Ocean, emptying at the Bay of California. Along the way it gathers run-off from a drainage basin 244,000 square miles in length, carves out the dramatic cliffs and canyons of southeastern Utah and Arizona’s Grand Canyon, and carries a silt load higher than any other river of comparable size. The Colorado is an international river, draining water from seven western states, (Wyoming, Colorado, Utah, New Mexico, Arizona, Nevada, and California) as well as Mexico. Moving from the highest peaks of the Continental Divide down to the low, arid deserts of the Sonoran and Mojave, the Colorado River is a vital artery running throughout some of the American southwest’s most spectacular (and unforgiving) landscapes. For much of human history, the Colorado River, and its tributaries, have served a vital role in providing life-giving water to the region’s inhabitants. Many Indian tribes of the southwest practiced dry farming and simple irrigation techniques using scant available water resources. This model was later expanded on by white settlers in the region, particularly the early Mormon settlers of Utah. The Colorado gained some measure of national celebrity from the famed expeditions taken down it by John Wesley Powell, first in 1869 and again in 1871-1872. These scientific trips gave Americans a better sense of the canyon country frontier, as described vividly by Powell, as well as providing Major Powell with some sense of the harsh environmental realities imposed by the arid deserts of the southwest. 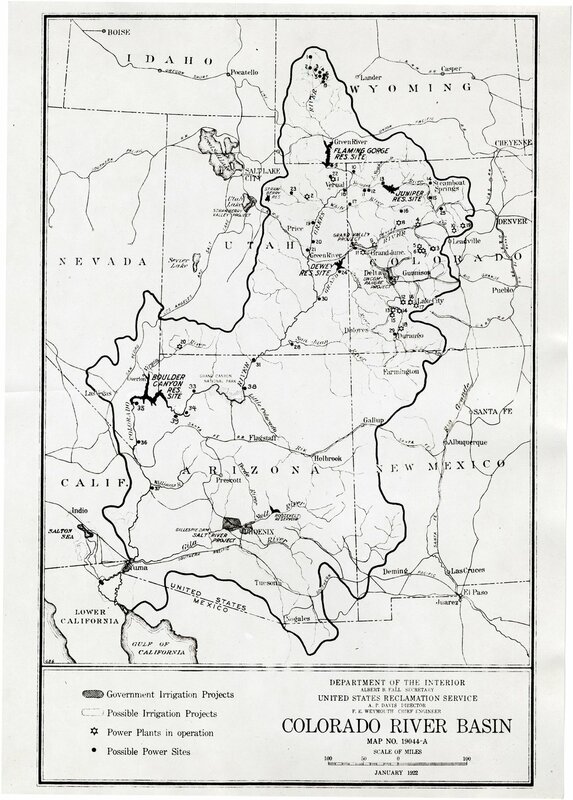 MAP OF THE COLORADO RIVER BASIN MADE BY THE BUREAU OF RECLAMATION IN 1922 (SERIES 13912). PHOTO COURTESY OF THE UTAH STATE ARCHIVES AND RECORDS SERVICE. The story of the Colorado River in the 20th century, a period when it would become the most legally regulated river on Earth, begins with the explosive population growth witnessed in Southern California at the turn of the century. Water projects that carried water from California’s Owens Valley helped fuel tremendous growth in Los Angeles and the San Fernando Valley. What if California’s rapacious, and seemingly unending, thirst lay claim to the bulk of available Colorado River water, and blocked anyone upstream from making later use of it? What if earthworks built by California to tame unpredictable floods from the Colorado locked in place an inequitable infrastructure, forever in favor of the Golden State? With these fundamental questions in mind, representatives from the seven basin states (as well as U.S. Commerce Secretary, Herbert Hoover) met on January 26, 1922 and began work on an expansive interstate compact to regulate and share the Colorado River among all of its interested parties. FIELDS IN CALIFORNIA’S IMPERIAL VALLEY IRRIGATED WITH COLORADO RIVER WATER. EPA PHOTO COURTESY OF THE NATIONAL ARCHIVES AND RECORDS SERVICE. In the eleven months between January and November, 1922 multiple meetings were held that would culminate in the Colorado River Compact. Over the course of its legal history, the various compacts, agreements, and legal decisions that have been placed on the Colorado River have come to be known as “the Law of the River.” In this regard, the Colorado River Compact is the backbone that serves to connect everything else together. Utah’s representative to the 1922 negotiations was State Engineer, R.E. Caldwell, having been appointed by Utah Governor Charles Mabey. Records from the State Engineer documenting Caldwell’s work on the Colorado River Compact (as well as other river-related records from the office) are held by the Utah State Archives in series 13912. The major provisions ultimately agreed to in the Colorado River Compact were unique, and critical in dictating all future development made on the river. The first of these provisions was the decision to effectively create two separate artificial basins within the larger Colorado River Basin. The Upper Basin was to consist of the mountain states of Wyoming, Colorado, Utah, and New Mexico (the states that provide the bulk of the flow to the river). The Lower Basin was formed from Nevada, Arizona, and California. The line of demarcation separating these two units was designated at Lee’s Ferry in northern Arizona. A second consequential provision of the compact stipulated how much flow from the river each basin was eligible to claim. Calculations for the Colorado’s annual flow were taken from dubious readings maintained by the Bureau of Reclamation during a multi-year period that saw the river rage higher than at any other point in its recorded history. Based on these flawed Bureau estimates, the flow of the Colorado River averaged 17.5 million acre-feet of water annually. The Colorado River Compact stipulated that 15 million acre feet of this share was to be divided equally between the Upper Basin and the Lower Basin. The Lower Basin was awarded an additional 1 million acre feet under the threat that its representatives would walk away from the negotiations without that bonus allotment. The final 1.5 million acre-feet of flow was reserved for Mexico, a number that was cemented into law by an international treaty in 1944. It was left for the states within each basin to determine the percentage of their allotted flow that would go to each state. UTAH’S COPY OF THE COLORADO RIVER COMPACT (SERIES 20221). PHOTO COURTESY OF THE UTAH STATE ARCHIVES AND RECORDS SERVICE. Each member representative from the compact negotiations signed the accord and returned to their respective state, leaving final ratification of the compact to state legislatures or voters. In Utah, the Colorado River Compact was ratified immediately by the Utah state legislature during its 1923 session, and the compact was filed with the lieutenant governor, where it is currently found in series 20221. The process of ratifying the agreement did not come easily for other states, however, as interstate squabbles arose over a host of issues. The most divisive of these occurred between Arizona and California, who couldn’t agree on how to divide the 8,500,000 acre-feet granted to the lower basin. For six years the Colorado River Compact languished until the U.S. Congress intervened with passage of a bill that simultaneously provided a path for formal ratification of the Colorado River Compact, as well as authorized the Bureau of Reclamation to begin work on what would become the largest dam project on Earth, up to that point. The Boulder Canyon Project Act of 1928 paved the way for nearly a century of reclamation activity on the Colorado River that has left a decidedly mixed legacy. One major provision of this piece of legislation was to make the Colorado River Compact legally binding. It sought to do this by settling the feud between California and Arizona over their shared water allocation. Accordingly, California was limited in its annual diversion to 4.4 million acre-feet per year, while Arizona was granted 2.8 million acre-feet (leaving the remaining 300,000 acre feet in the lower basin to Nevada). The Boulder Canyon Project Act went on to say that the Compact would become legally binding upon ratification by six of the states, one of those states needing to be the compact’s biggest player, California. This was accomplished, in spite of the fact that Arizona (out of protest) refused to formally ratify the compact until 1944. In 1927, the year before the Boulder Canyon Project Act was passed, the Utah legislature formally repealed their original 1923 ratification of the compact. This was followed, in 1929, by a second ratification of the Colorado River Compact by the state of Utah, as well as the creation of a Utah Colorado River Commission. This commission, whose records can be found in series 165, was made up of three members appointed by Governor George Dern, and tasked with representing Utah’s interest on all matters related to the Colorado River. The second major provision of the Boulder Canyon Project Act, was a mandate to build the first major dam site on the Colorado River. The location chosen for this was in the Black Canyon near Las Vegas. Construction on the Boulder Dam (later renamed Hoover) commenced during the heart of the Great Depression, in 1931. Over the course of six years thousands of workers built massive diversion tunnels, rerouted the Colorado River from its bed, sunk the foundations for the dam at bedrock, and ultimately constructed a 726′ plug in the Black Canyon that could hold back up to 28,537,000 acre-feet of Colorado River water in the impounded area named Lake Mead. The water held at Hoover Dam has served a variety of purposes in the ensuing decades. A canal built downstream (named the All-American Canal) carries water from the Boulder project west, into California’s Imperial Valley. The water of Lake Mead has been used for recreation, irrigation, industrial use, and municipal use in both Las Vegas and the cities that mushroomed in southern California throughout the 20th century. Hydroelectric power derived from the dam has played a pivotal role in growing the populations in one of North America’s most inhospitable environments. Electricity generated at Hoover Dam has helped build industry, attract tourism, and provide critical hydration and conditioned air in a region often devoid of both. 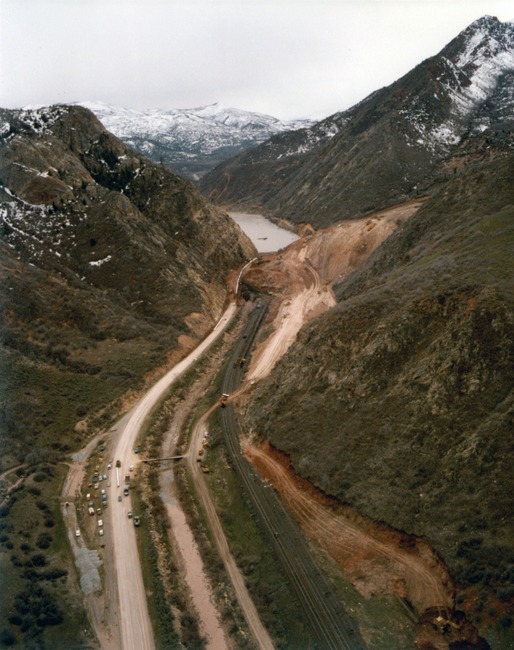 PHOTOGRAPH OF THE BOULDER CANYON DAM SITE BEFORE CONSTRUCTION (SERIES 13912). PHOTO COURTESY OF THE UTAH STATE ARCHIVES AND RECORDS SERVICE. The Hoover Dam served as the first vivid example of what a massive, federally backed water project on the Colorado River could look like. 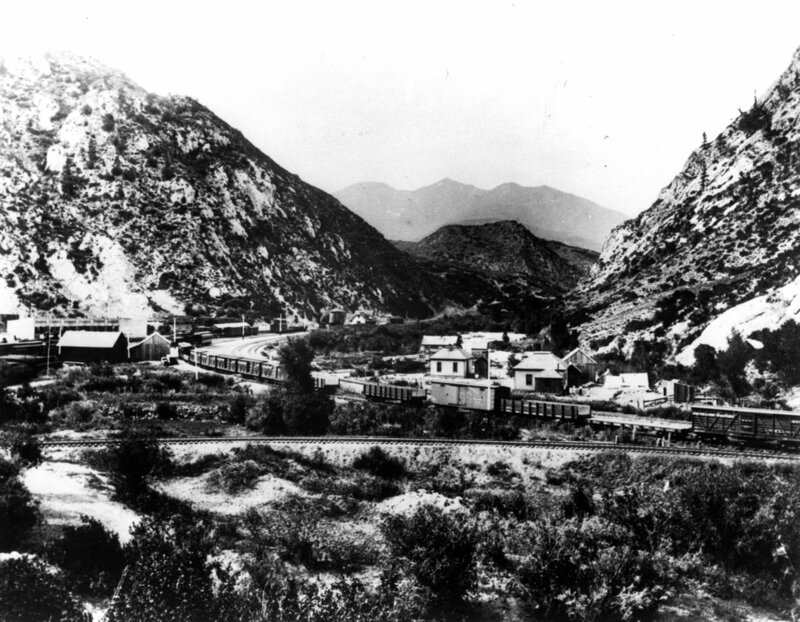 Upstream, leaders of the Upper Basin states kept a keen eye on the tremendous growth in the Lower Basin spurred by the Boulder Canyon Project. In many ways, the dam provided a template for future projects in the Upper Basin, as well as providing incentive for the Upper Basin states to organize into a coalition, lest they eventually lose their allotted water share to future projects in the Lower Basin. Evidence that developing the state’s Colorado River share was a pressing issue for Utah leaders is found in records kept by two different governor’s of that era. Governor George Dern (1925-1933) maintained a subject file on the Colorado River Compact (series 206) that reflect Utah’s interaction with other western states on Colorado River issues, as well as the negotiations and discussions that went on with the 1928 Boulder Canyon Project. Dern’s successor, Governor Henry Blood (1933-1941), in turn, maintained a Colorado River correspondence files (series 22918), which contains legislative bills, resolutions, general correspondence, minutes and reports related to Utah’s earliest attempts to help devise an Upper Basin reclamation plans to assure its share of water as designated in the Colorado River Compact of 1922. The Colorado River Compact and the Boulder Canyon Project Act provided the thread upon which all of the states in the Colorado River Basin would ultimately go about drawing on their share of the Colorado River’s seemingly vast potential. The story of Utah’s participation in developing a reclamation plan for the Upper Basin, and the implementation of projects based on that plan, will serve as the story for the next blog in this series. SSC SITING PROPOSAL FOR THE CEDAR MOUNTAINS AREA NEAR SKULL VALLEY (SERIES 83904). PHOTO COURTESY OF THE UTAH STATE ARCHIVES AND RECORDS SERVICE. The history of human activity in Utah’s Great Salt Lake Desert suggests that it is a place where the biggest of human ideas can take root. During the 1980’s this tendency took the shape of a detailed proposal to turn a section of Great Basin desert into the world’s most cutting edge science and research destination. 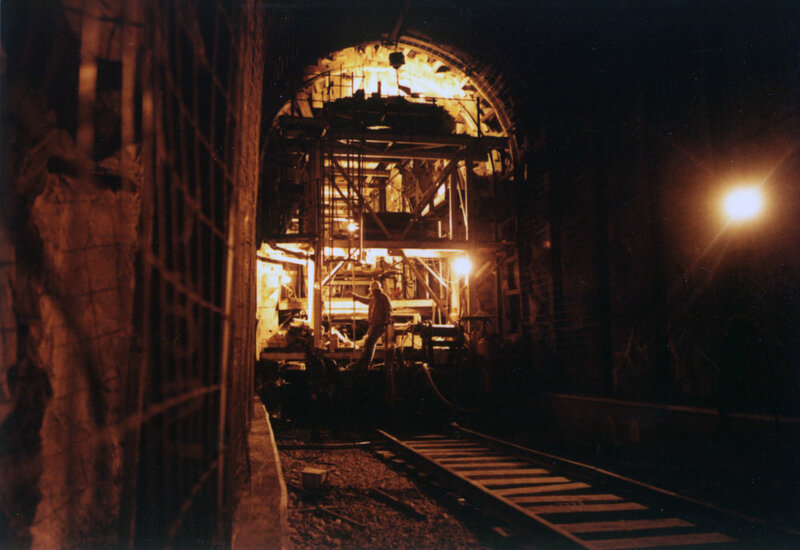 The story begins in 1987 when the U.S. Department of Energy (DOE) announced plans to undertake a site-selection process that would find a home for the world’s largest superconducting super collider (SSC). The design of a super collider called for two proton beams to be aimed at one another. In a super collider, particles moving at near the speed of light smash into one another and are broken down to their most basic subatomic particle units. In this way conditions that appeared moments after the Big Bang are replicated and scientists are able to learn more about the most basic forces that govern our universe. DIAGRAM OF HOW THE SSC WOULD OPERATE (SERIES 83904). PHOTO COURTESY OF THE UTAH STATE ARCHIVES AND RECORDS SERVICE. For Utah leaders the SSC appeared to have the more tangible benefits of potentially spurring massive social and economic growth along the Wasatch Front. 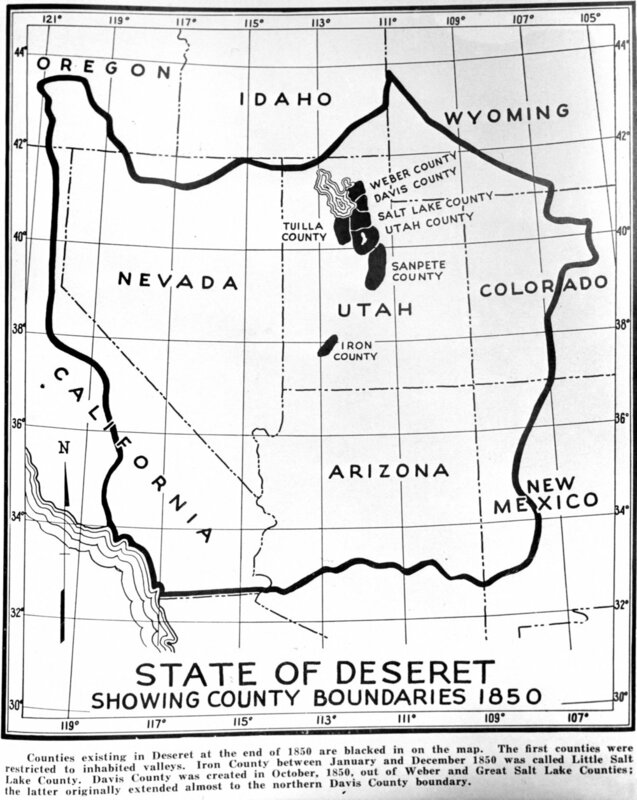 With Governor Norman Bangerter acting as Utah’s principle agent, state planners determined that Utah would make a formal proposal to the DOE for construction of the SSC in Utah’s Great Basin Desert. Early estimates pegged the project’s construction cost at $600 million per year over a six or seven year period. This included an influx of approximately 4,000 construction jobs and an annual operating budget for the SSC upon completion that would have totaled $270 million per year. The consulting firm of Dames and Moore was hired by the state to conduct a site review and help draft the formal proposal that fit the site specific qualification criteria demanded by the DOE. Dames and Moore was assisted in the process by the Ralph M. Parsons Company, Roger Foott Associates, Inc., Bear West Consulting, the Wasatch Front Regional Council, and the Data Resources Section of the Utah Office of Planning and Budget. The qualification criteria for the SSC that was issued by the DOE reveal the massive energy and resource needs of the project. The design of the SSC called for a tube 10 feet in diameter to be buried 20 feet below the ground surface, in order to shield above ground monitoring areas from radiation. This tube would have run 52 miles in an oval raceway measuring 17.4 miles by 14.6 miles. The above ground monitoring and campus facilities were to be connected to the underground testing areas. The DOE estimated that 4,000 acres was needed for above ground operations, with additional rights to another 4,000 to 5,000 acres for future tunneling. The power and water demands for the SSC and its off-site support facilities would have been equivalent to a town of 30,000 people. PHOTOGRAPH OF UTAH’S SSC TASK FORCE (SERIES 83904). PHOTO COURTESY OF THE UTAH STATE ARCHIVES AND RECORDS SERVICE. Two initial reports were created by Dames and Moore in February and March of 1987 that laid out the specifications of the SSC, as well as an initial assessment of areas in Utah that could prove feasible for construction. Based on these reports, two areas in Utah’s west desert were chosen for a more thorough assessment and review. Ultimately two separate multi-volume proposals were created for the sites in question. The first, entitled the “Cedar Mountains Siting Proposal” focused on a region 52 miles west of Salt Lake City, near Skull Valley. The second proposal, entitled the “Ripple Valley Siting Proposal” focused on an area 69 miles west of Salt Lake City, near the Knolls exit on Interstate 80. The reports generated for each site proposal focused on geology, local environment, public land availability, regional conditions, and available utilities and infrastructure. They also laid out concessions the state of Utah was willing to make to the DOE to ensure site selection. The formal siting reports were submitted to the DOE for review on September 02, 1987. Due to the immensity of the SSC proposal, multiple government agencies were involved in its planning. The records created from this process are now held by the Utah State Archives. They include SSC proposal records from the Utah Energy Office, SSC Task Force records from the Governor’s Office of Planning and Budget, special project files from the Utah Department of Natural Resources Geological Survey, economic development recordsfrom the office of Governor Norman Bangerter, and SSC records from the Utah Office of Economic Business and Research. LETTER ON DOE’S DECISION TO NOT SELECT UTAH FOR THE SSC (SERIES 10263). PHOTO COURTESY OF THE UTAH STATE ARCHIVES AND RECORDS SERVICE. In December 1987, the National Academy of Science, and the National Academy of Engineering made a recommendation to the U.S. Department of Energy that Utah not be included on the shortlist of sites for the SSC. Instead, the project was ultimately awarded to Texas in November 1988. Construction on the SSC (now nicknamed “Desertron”) began in 1991 near the central-Texas town of Waxahachie. During construction seventeen shafts were sunk and 14.6 miles of tunnel were bored (out of an estimated 54.1 miles needed) before claims of government mismanagement, sky-rocketing costs, an oncoming recession, and shifts in federal political power combined to end construction on the project for good in 1993. By the time construction was halted the federal government had spent $2 billion dollars on the SSC (with an estimated price tag of an additional $12 billion needed to successfully finish it). Some of the massive costs associated with the project can be pinned on the extreme difficulties workers encountered with tunneling through bedrock and creating the needed infrastructure deep underground. Had the SSC project been completed, its two 20 TeV per proton energy beams would have made it the largest super collider on Earth (even larger than the Large Hadron Collider that was built near Geneva, Switzerland that became operational in 2009). The DOE ultimately deeded the SSC site in Waxahachie to Ellis County, Texas after construction was halted. In 2006 the site was sold to a private company which began marketing it as a data center. The site was sold again in 2012 to chemical company, Magnablend. In retrospect, it is interesting to consider the fate of the SSC had the site selection process landed on Utah, making this one of the better “what if” stories in recent Utah history! Utah State Archives and Records Service, Utah Energy Office, Superconducting Super Collider Proposal, Series 353. Utah State Archives and Records Service, Governor’s Office of Planning and Budget, Superconducting Super Collider Task Force Records, Series 10263. Utah State Archives and Records Service, Department of Natural Resources Geological Survey, Special Report Files, Series 25708. Utah State Archives and Records Service, Economic Business Research, Superconducting Super Collider Records, Series 83904. Kevles, Daniel J. “Good-bye to the SSC: On the Life and Death of the Superconducting Super Collider.” Engineering and Science Winter, Vol. 2 (1995): 15-26. Web. 17 Nov. 2014. 1936 MAP OF THE PROPOSED ESCALANTE NATIONAL MONUMENT (SERIES 22028). In September 1996, President Bill Clinton made the controversial decision to draw on powers reserved to him by the 1906 Antiquities Act, and designate 1,880,461 aces of land in southern Utah as the Grand Staircase-Escalante National Monument. But did you know that sixty years earlier federal officials were pondering the designation of a similar monument that would have dwarfed the area covered by today’s Grand Staircase? The story begins in 1936 when Utah State Planning Board Director, Ray B. West contacted assistant director of the National Park Service (NPS), A.E. Demaray about the possibility of the service building a federal park-to-park highway linking the remote southern Utah towns of Hanksville and Blanding. West’s contention was that this highway would serve a vital role in connecting Mesa Verde National Park to the proposed Wayne Wonderland area in central Utah (an area that would later become Capitol Reef National Park). 1936 LETTER FROM RAY B. WEST TO GOVERNOR HENRY BLOOD (SERIES 22028). A response to West’s letter came from NPS director Arno Cammerer, who stated that the agency was considering making a recommendation to President Franklin Roosevelt to designate an enormous section of the state as a new “Escalante National Monument.” Cammerer further intimated to West that the Hanksville-to-Blanding road he had requested would face better odds of being completed if Utah government officials were willing to support the NPS proposal. The 1936 NPS proposal was staggering in its scope, taking in 6,968 square miles of southern Utah land (approximately 8% of the state). Almost immediately the State Planning Board undertook a study, at the request of Utah Governor Henry Blood, to determine how monument designation might impact Utah’s grazing, mineral, and water rights along the Colorado River. Opposition to the monument proposal grew in Utah, and in 1938 the parks service put out a second proposal for the monument, scaling dramatically back on its original size. This new monument would claim approximately 2,450 square miles of land along the Colorado River. MAP OF THE MODERN DAY GRAND STAIRCASE-ESCALANTE NATIONAL MONUMENT. When the second park proposal was met with resistance from Utah officials, NPS administrators and Secretary of the Interior, Harold Ickes, changed course. Federal agents backed off the idea of having President Roosevelt unilaterally claim the region as a national monument, and instead proposed that the U.S. Congress designate it a national recreation area. 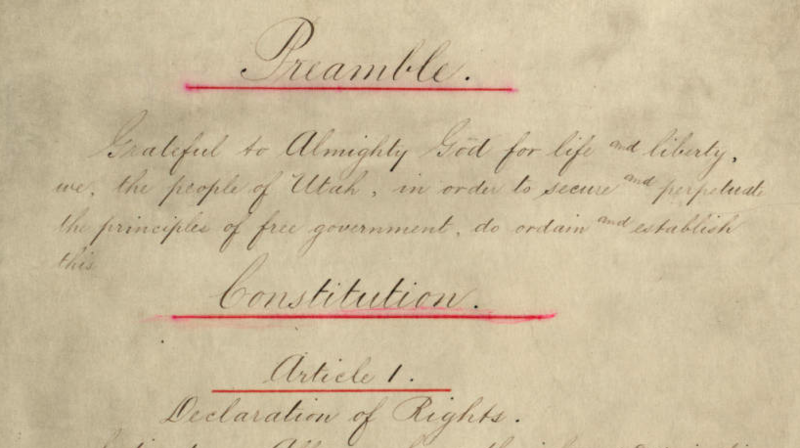 Under such a designation, the state of Utah would have maintained many of the development rights over natural resources, which had served as the greatest source of concern for state officials. Ultimately, however, the bill to create the Escalante National Recreation Area never made it out of congressional committee. When Japanese forces attacked the U.S. naval base in Pearl Harbor, Hawaii on December 7, 1941, a chain of events was set in motion that would permanently alter the directions of each country and its citizenry. Pearl Harbor led to direct U.S. involvement in World War II, drawing millions of U.S. soldiers and citizens into the war effort. Involvement on the war front had the dramatic effect of reorienting the American economy, which in turn set the stage for the industrial and commercial development that would help the United States achieve the level of global superpower in ensuing post-war decades. U.S. involvement in World War II would fuel the atomic fires of the Manhattan Project and result in the first (and only) use of nuclear weapons against Japanese citizens at Hiroshima and Nagasaki. And for many Americans, the bombing of Pearl Harbor served as the catalyst for a cascade of executive actions that would pit the federal government in unfortunate opposition with a segment of its citizenry. ALIEN ENEMY REGISTRATION FORM (SERIES 22990). In the wake of Pearl Harbor, President Franklin Roosevelt signed Presidential Proclamations 2525, 2526, and 2527, which created the legal apparatus that U.S. government officials would utilize to forcibly register suspected alien enemies and eventually displace and intern 120,000 human beings by war’s end. Between 1942 and 1945, individuals of Japanese, German, and Italian descent faced the prospect of sitting before local alien resident hearing boards, forcible registration as alien enemies, and potential internment in far flung camps across the western landscape. On the heels of his December, 1941, Presidential Proclamations on Alien Enemies, Franklin Roosevelt took a decisive step, when on February 19, 1942, he issued Executive Order 9066. This order called for the immediate evacuation from the West Coast of individuals who had been deemed an immediate threat to national security. Over the following six months over 100,000 individuals of Japanese descent were forcibly removed from their homes in Washington, Oregon, and California and relocated to hastily constructed internment camps scattered throughout California, Idaho, Montana, Utah, New Mexico, New York, North Dakota, Tennessee, and Texas. CORRESPONDENCE ON SUSPECTED JAPANESE ALIEN ACTIVITY (SERIES 22990). 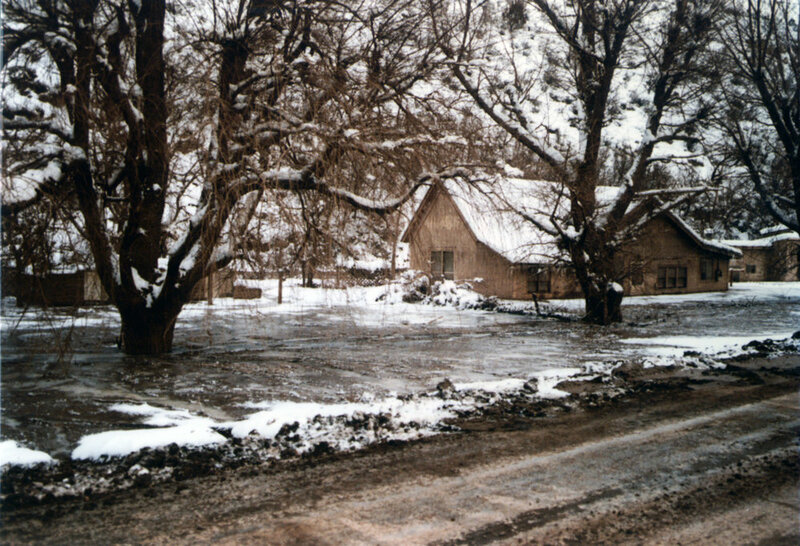 The Topaz War Relocation was formally closed on October 31, 1945, and its inhabitants allowed to return to their homes. In the ensuing post-war decades, the treatment suffered by camp detainees became an increasingly difficult matter for the federal government to reconcile. This would eventually lead to the passage of the Civil Liberties Act that was signed into law by President Ronald Reagan on August 10, 1988. In addition to issuing a formal apology to innocent individuals who had faced detainment, the bill also provided a means for those who had suffered the indignities of internment to apply for monetary compensation from the federal government. Often internment in a relocation camp was based on contentious hearings before local alien registration boards, where local prejudices and weak (often unsubstantiated) evidence and accusations might be leveled at the accused. A common occurrence often entailed an older, non-U.S. citizen alien being relocated and voluntarily joined in their internment by family members who did hold valid U.S. citizenship. This dark moment also put the onus squarely on Japanese-Americans to demonstrate their citizenship and loyalty to a country that had become deeply suspicious of them. Evidence of this exists in the form of records held by the Utah State Archives that were created by the Davis County Sheriff. CORRESPONDENCE FROM REGISTERED ALIENS LIVING IN DAVIS COUNTY (SERIES 22990). In order to obtain this second registration, Justice Department officials often relied on local law enforcement officers to obtain registration data on suspected aliens, as well as forward along suspicions to members of the federal intelligence community. The records found in series 22990 contain the registration data collected by the Davis County Sheriff, as well as periodic correspondence from the sheriff to federal authorities. Most often the data captured in these registration forms includes the name of the individual being registered, information on family members living within one residence, and an inventory of all guns and ammunition owned by the registrant. The Alien Enemy Registration Forms from Davis County reveal one level of the war effort that has gone largely forgotten. 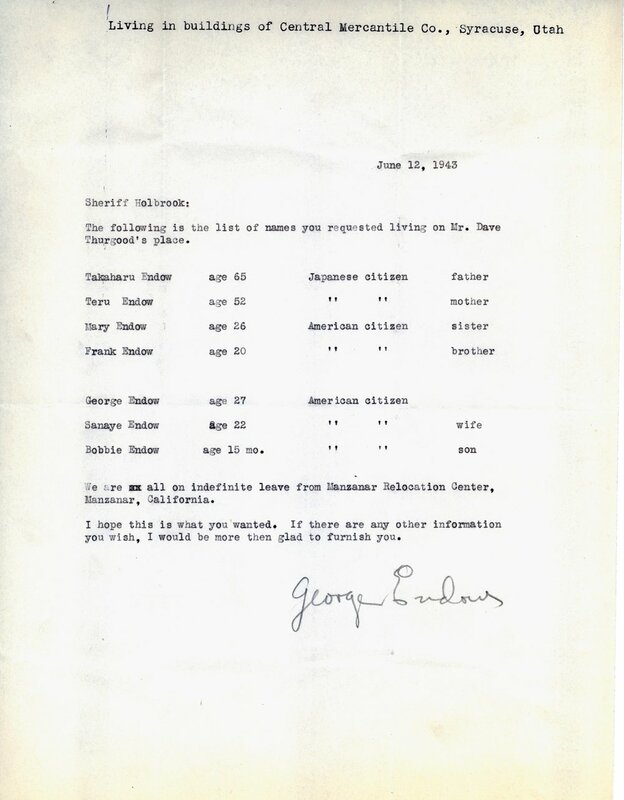 In addition to providing valuable genealogical information on residents of Davis County during the World War II era, these records help illuminate the pervasive contours of one of the darker moments in U.S. history, serving as a powerful reminder that blind fear and paranoia are antithetical to quality governance. Utah State Archives and Records Service. Davis County Sheriff. Alien Enemy Registration Forms. Series 22990. HORSES WITH RADIATION BURNS - SERIES 11571 - PERMISSION OF THE UTAH STATE ARCHIVES AND RECORDS SERVICE. The spring of 1953 brought with it unusually large losses in sheep herds that had spent that winter grazing in the mountains of southern Nevada and southern Utah. The winter and spring of 1952/1953 had been unusually dry, and most livestock owners had provided their herds with supplemental feed and water to make it through to summer. Of the approximately 11,710 sheep that had wintered within 40 miles north and 160 miles east of the Nevada Test Site (NTS) in 1953, 1420 lambing ewes and 2970 new lambs would ultimately succumb to a painful and mysterious death in the ensuing year. In addition to the disturbing number of deaths, sheep owners also observed that many of their animals appeared to suffer from unusual burns on their faces and bodies. These burns were reminiscent of those documented in cattle that had been near the in New Mexico, when the world’s first atomic weapon was detonated on July 16, 1945. 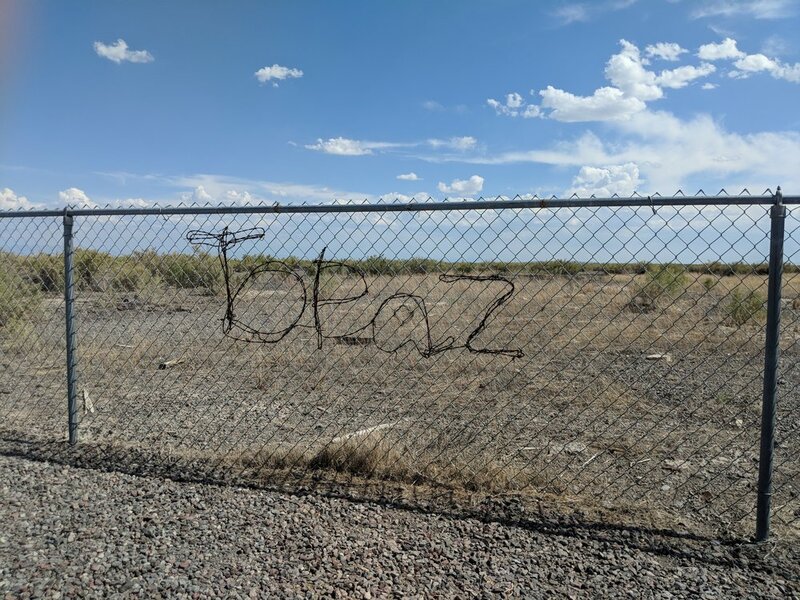 The burns were also similar to the beta burns found on horses living near the NTS, where above-ground nuclear testing had been taking place since 1951. Speculation quickly focused on two NTS nuclear test series, Operation Tumbler-Snapper conducted in 1952 and Operation Upshot-Knothole conducted in 1953, as the source of death and injury witnessed among the Cedar City sheep herds. MAP OF THE AREA EFFECTED BY TESTS AT THE NTS IN 1952 AND 1953 - SERIES 11571 - PERMISSION OF THE UTAH STATE ARCHIVES AND RECORDS SERVICE. The first veterinarians outside of the Cedar City region to investigate the mysterious sheep deaths were John Curtis and F.H. Melvin, who were assisted by the Bureau of Animal Industry (under the Department of Agriculture). Both men were concerned with the possibility that radiation had played a primary role in the sheep deaths, and what that could mean for the human populations of southern Nevada and Utah. After their investigation, Curtis and Melvin returned to Salt Lake City and voiced their concerns to the director of the Utah Department of Health, Dr. George A. Spendlove. Based on that report, Spendlove immediately requested epidemic aid from the U.S. Public Health Service (USPHS) for further study. 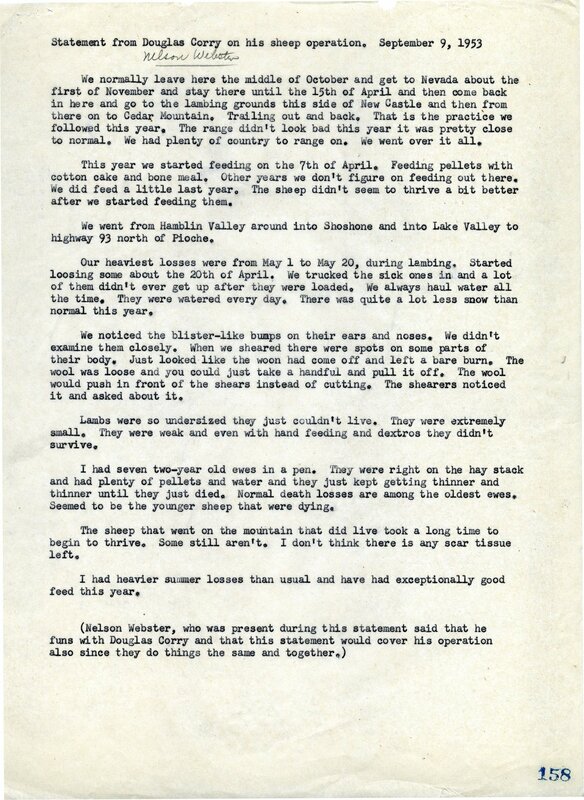 In early June the USPHS sent three of their own investigators to Cedar City. These representatives included Monroe A. Holmes (a veterinarian for the Public Health Service Communicable Disease Center), Arthur H. Wolff (a veterinary radiologist at the Environmental Health Center), and William G. Hadlow (a veterinary pathologist at the Public Health Service Rocky Mountain Lab). When the USPHS representatives arrived in Cedar City they were joined by two investigators from the Atomic Energy Commission (AEC), the agency responsible for administering nuclear tests at the NTS. These AEC representatives included Major R.J. Veenstra (an Army veterinarian attached to the Naval Radiological Defense Lab in San Francisco), and R.E. Thompsett (a veterinarian on contract with the AEC who ran a private practice in Los Alamos, New Mexico). The team of USPHS and AEC investigators observed sick lambs in Cedar City and initially concluded that radiation and malnutrition were the most likely candidates for problems afflicting the herds. Melvin A. Holmes drafted a report that brought together the investigative work from the seven different agencies initially involved with analyzing the sheep losses in Cedar City. In addition to the main report, individual reports were filed by Wolff, Veenstra, and Thompsett, each of which mentioned radiation more prominently than Holmes as the likely cause of the sheep deaths. These reports were immediately classified by the AEC and not provided to Cedar City sheep owners or local Iron County authorities. SHEEP NECROPSY REPORT FROM W.J. 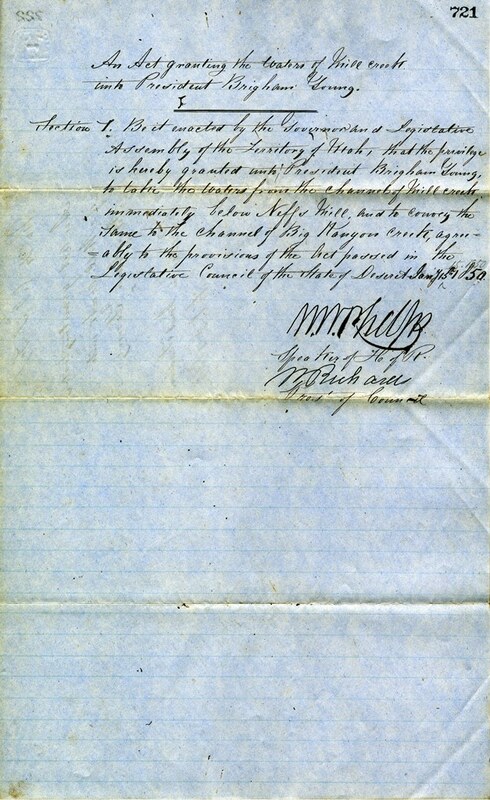 HADLOW - SERIES 11571 - PERMISSION OF THE UTAH STATE ARCHIVES AND RECORDS SERVICE. STATEMENT FROM DOUGLAS CORRY ON HIS CEDAR CITY SHEEP OPERATION - SERIES 11571 - PERMISSION OF THE UTAH STATE ARCHIVES AND RECORDS SERVICE. The AEC was loathe to compensate for livestock losses based on harmful radiation due to the precedent it would have set for future claims of loss from exposure to fallout from tests at the NTS. This led to the AEC organizing a second investigation of the sheep herd losses in Cedar City in the summer of 1953. The investigators used in the second investigation had much closer ties to the AEC than those members of the first investigation team. They included Dr. Paul B. Pearson (chief of the AEC Division of Biology and Medicine), Lieutenant Colonel Bernard F. Trum (an Army veterinarian assigned tot he AEC agricultural research program at Oak Ridge, Tennessee), and Lieutenant Colonel John Rust (also of the AEC agricultural research program at Oak Ridge). This second investigatory group focused exclusively on malnutrition as the primary cause of sheep herd loss, and maintained zero contact with members from the first investigation. In a later court case, Iron County extension agent, Stephen Brower recalled a conversation with Paul Pearson in which the latter claimed that the AEC couldn’t expose itself to the risks of setting a precedent in paying sheep owners for their losses. Instead he suggested that the AEC might help fund a range study, again reinforcing the malnutrition narrative as the sole reason for losses and damages to the sheep herds around Cedar City. The AEC did subsequently provide $25,000 for a range study in the Cedar City and Nevada areas used by the sheepmen. REPORT FROM OCTOBER 1953 LOS ALAMOS CONFERENCE ON LIVESTOCK LOSSES - SERIES 11571 - PERMISSION OF THE UTAH STATE ARCHIVES AND RECORDS SERVICE. In August of 1953 all participants from the first and second sheep death investigations met in Salt Lake City to review the evidence from both studies. At this meeting there was concerted effort placed on the first group of investigators to abandon their position that radiation was a primary contributing cause to the sheep deaths. On August 9, 1953, Paul Pearson met with livestock owners in Cedar City to discuss the second group of investigators findings. At that time malnutrition and disease in the herd were cited as the likely culprits. It was also at this time that AEC officials began advancing the premise that radiation levels from the NTS tests were too low to cause radiation poisoning in the sheep herds. In order to validate this claim separate radiation studies were conducted on sheep herds living near heavily irradiated sites in Los Alamos, New Mexico and Hanford, Washington. Sheep in these studies were exposed to varying levels of radiation and the effects were documented. On October 27, 1953 members of both studies and AEC officials met in Los Alamos to again review evidence from the studies, as well as the evidence from the sheep radiation tests from Los Alamos and Hanford. The secretary for the meeting was AEC official Charles Dunning, who subsequently drafted a short report stating that the expert opinion held that there was a preponderance of evidence against fallout as a contributing cause in the sheep deaths. This report was signed by those in attendance, but the strong dissenting opinions from outside the AEC (primarily from Veenstra, Holmes, and Thompsett) remained. STATEMENT FROM PAROWAN SHEEP OWNER T. RANDALL ADAMS ON SHEEP LOSS- SERIES 11571 - PERMISSION OF THE UTAH STATE ARCHIVES AND RECORDS SERVICE. With the resumption of atmospheric atomic tests as part of the Operation Teapot test series at the NTS in 1955, Cedar City sheep owners who had suffered heavy losses in 1953 filed suit against the AEC for $177,000 in damages. This led to AEC and Justice Department lawyers placing heavy pressure on members of the first investigation to officially change their position that radiation had served as a primary cause of the Cedar City sheep deaths (in order for the government to put up a unified front as defendant). R.E. Thompsett (of the first investigation team) was heavily dependent on AEC money to fund a private animal hospital in Los Alamos, and eventually went on the record as abandoning his belief that radiation was a contributing cause. At the same time both Monroe A. Holmes and R.J. Veenstra (also of the first investigation team) agreed to disqualify themselves as expert witnesses if called upon to testify. The trial took place in federal court in September of 1956 and lasted fourteen days. The government was represented by John Finn of the Justice Department’s Torts section, while the sheep owners were represented by Dan S. Bushnell. The judge presiding over the case was A. Sherman Christensen. The government’s defense (backed by expert witnesses and unclassified records) maintained that fallout levels from the Upshot-Knothole Test Series were too low to cause the sheep deaths, and that the timing between the atomic tests and subsequent sheep deaths was purely a coincidence. Judge Christensen sided with the expert testimony provided by the AEC, stating that the government was negligent in not warning sheep owners of potential fallout in the area, but nothing more. SCHEDULE OF NUCLEAR TESTS AT THE NEVADA TEST SITE DURING 1953 - SERIES 11571 - PERMISSION OF THE UTAH STATE ARCHIVES AND RECORDS SERVICE. In 1979 a second case was brought to federal court, this time arguing that fallout from the Nevada Test Site was responsible for the death and suffering of human inhabitants of the downwind area south and east of the NTS. At this time records that had formerly been classified became public and the extent of the AEC cover-up with the 1952-1953 sheep case came to light. Original records from the sheep studies revealed that the radiation dose levels in the thyroids of the affected Cedar City sheep were nearly 1000 times the permissible dose for humans. Records also revealed the extent to which AEC officials went to get members of the first investigation team to change their opinion of radiation as a primary cause in the sheep herd losses. In February of 1981 six of the original plaintiffs from the 1955 lawsuit brought a new suit to federal court asking for a new trial. They claimed that fraud had been committed upon the court by AEC and Justice Department officials. Judge A. Sherman Christensen heard the case again and the plaintiffs were again represented by Dan S. Bushnell. A settlement offer was extended to the government of three million dollars for damages, but government representatives refused the offer. Evidence was heard over four days in May of 1982 and Christensen delivered his decision in August, ruling that at the time of the sheep radiation studies the AEC held monopoly on information and that government experts and attorneys had deliberately acted to withhold certain pieces of that information from the court. Judge Christensen ordered that a new trial was to be held, but that decision was overturned on appeal by the Tenth Circuit Appeals Court in Denver. Eventually the case made its way to the U.S. Supreme Court where the Tenth Circuit decision was sustained by a 5-3 vote in January of 1986. Chief Justice Warren Burger (who had served as head of the Justice Departments Civil Division at the time of the original sheep case in 1955) disqualified himself from making a formal decision in the case. Another court case was brought against the U.S. government in the early 1980’s and included residents from Iron County. The suit sought damages from the federal government, and was initially successful on a ruling from Judge Bruce Jenkins that awarded some damages to downwind cancer victims, and their families. However, the case was appealed, and the decision was also overturned by the federal Tenth Circuit Court of Appeals. To date, the most tangible action taken to address the legacy of atmospheric nuclear testing in Nevada, and the impact it had on nearby populations, was passage of the 1990 federal Radiation Exposure Compensation Act, which created a trust-fund to award individuals who suffered from radiation-related injuries that occurred before adequate safety warnings were given, or safety protocols enacted in an effected area. CORRESPONDENCE ON PENDING MACKELPRANG LAWSUIT FOR INJURIES SUFFERED FROM ABOVE-GROUND NUCLEAR TESTING - SERIES 11571 - SERIES 11571 - PERMISSION OF THE UTAH STATE ARCHIVES AND RECORDS SERVICE. 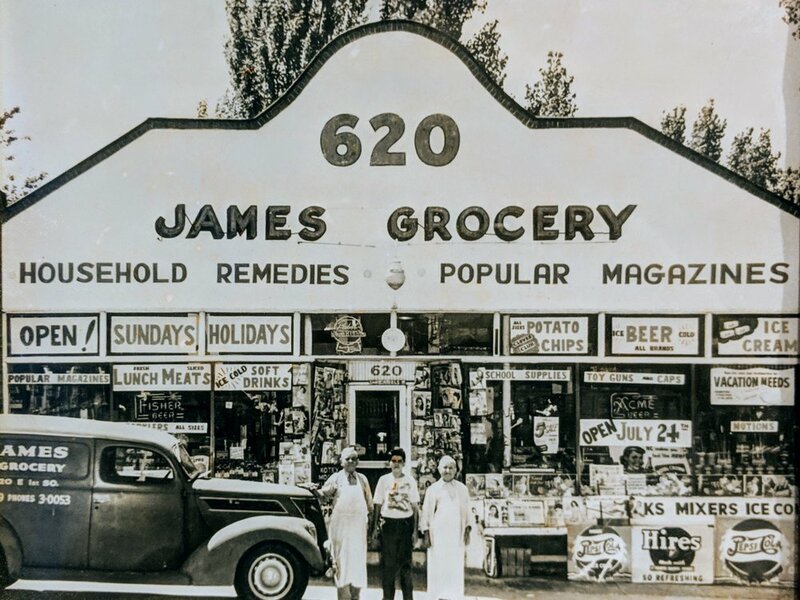 The story of the 1953 sheep deaths in Cedar City can be traced through sheep radiation study records created by the Utah Department of Health, and now maintained by the Utah State Archives and Records Service. Other related records include radiological surveillance reports and radiation study reports from the Utah Department of Health, administrative records and occupational health hazard records from the Utah Department of Environmental Quality, and Environmental Coordinating Committee minutes and agendas from the Utah Division of Environmental Health. A final valuable resource held by the Utah State Archives is various radiation study records gathered by the office of Utah Governor Scott Matheson. This collection, in particular, pulls together a variety of materials from a broad range of state and federal government agencies regarding tests conducted at the Nevada Test Site and their impacts on local southern Utah communities. These records once served as the backbone for policy decisions and stances on the issue of downwinder recompensation made by Governor Matheson, who himself grew up in the southern Utah town of Parowan during the era of above-ground atmospheric testing, and would later pass away from a rare multiple myloma cancer in 1990. Fradkin, Philip L. Fallout: An American Nuclear Tragedy. Boulder: Johnson Books, 2004. Fuller, John G. The Day We Bombed Utah: America’s Most Lethal Secret. New York: New American Library, 1984.